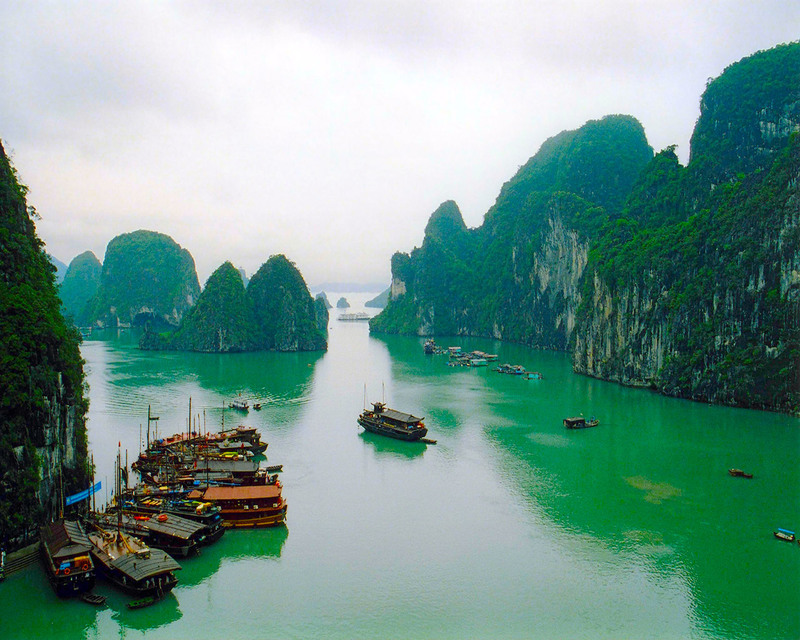 This is a stunning photograph of Halong Bay, located in the north-east of Vietnam not far from the capital, Hanoi. Unfortunately, I did not take this one, and due to being an amateur point and clicker, and not withstanding the weather, our photo’s didn’t do the place justice. My postings and musings on Vietnam have probably been overly negative. A few bad eggs and the whole experience can become slightly tainted. Looking back at our photographs brought back a lot of happy memories, especially with the benefit now of some hindsight and maybe a bit more balanced perspective. Vietnam is one country where we really pushed ourselves on to visit as many towns, cities and rural villages as we could within a one month window. It was pretty hectic, but looking back, we had such a relaxed time motorbiking around the Mekong, taking in beautiful rugged coastal and rural scenery. The locals were very friendly, and the young kids can always make you burst into a huge wide grin. Saigon was a personal favourite, although the incessant roar and din made by a thousand motorbikes makes it hard to get to relax, unless you get into the heart of the central parks, or the back of some drinking den late at night. Hoi An is a beautiful riverside town, full of colour and quaint buildings and architecture. It is very touristy, but then, when you see the place and couple this with the level of amenity, it really is no surprise that it is a top draw. Dalat is also worthy of a mention. Set in the bowl of a hilly and mountainous landscape, it has a truly european feel. The temperature drop is significant, and add’s further to the sense that you have been transported back to europe. Vietnam has had a hard time of it in the context of its previous history. Museums and galleries display and illustrate vividly in text and horrific iconic images, the horrors of the war and it’s disastrous after effects. The main thrust of the tourist industry seems to surround the history of the war, where you can visit the VC tunnels, famous battle sites eg. Hamburger Hill, and military style museums. I don’t think either of us have any real interest in any of this to be honest, but we have come away with a much better understanding of the history from this period. The Vietnamese are certainly a hardy resilient people, and the images of elderly women working in fields, back breakingly ploughing and hoeing fields under intense heat is one vision that will stay in my head.